How do 3D objects coincide with traditional 2D animation? I was watching an episode of Shirobako. I love how the anime gives you a slight in-depth view on the production process. However, something I can't get my mind around is those few segments that involve CGI (in anime in general) with the interaction of traditional 2D animation such as stationary or moving objects. In the episode, a scene in Exodus where the girls rides a jeep while avoiding explosion was shown in key animations/"genga": http://sakuga.yshi.org/post/show/10903. As you can see, the 3D bike and characters basically move together on a plane. 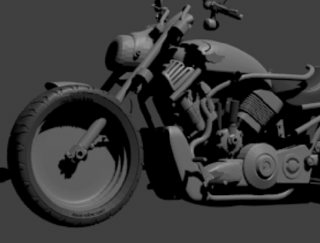 Could it be that the bike is animated frame by frame in traditional animation somehow? Or the other way around? Or could it be more technical than those? 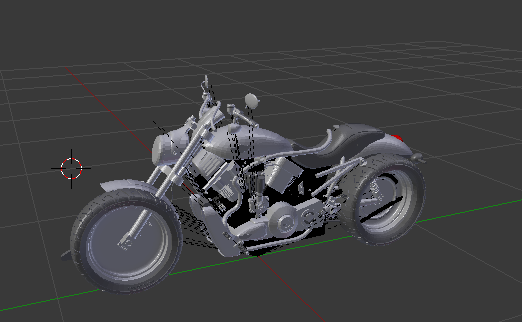 The bike can be animated in a 3D model editor application and overlayed upon the ready 2D frames. It doesn't really matter which application both come from, since they can all export frames to static images. 3D editors have motion direction, of course, or else we would not see much 3D movies. 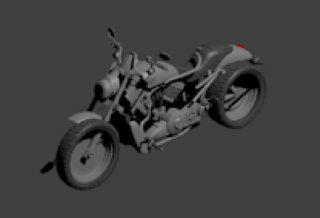 And you can not add anything else aside from the main 3D mesh with applied texture, so that the background will be transparent upon frame export. You know how they have those "layers" in Photoshop? Well, that is it. One of them comes from 2D app, the other from 3D. Nothing special. You say "traditional animation", but that really means collaging paper elements on a table, taking a shot of the scene and later on gluing together the resulting frames into a cinema roll. You must want to know about the modern day way, so that is what I described above. 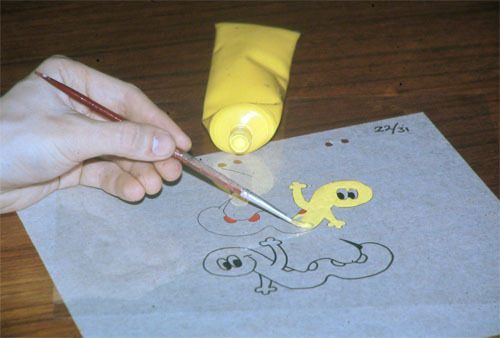 Older animation techniques require the use of celluloid sheets, which are transparent sheets of plastic, to make the things simple. Are you familiar with the term cel-shading? Well, this is where the modern day 3D animation technique comes from − the older days method of drawing the outline of objects on a cel sheet. It goes something like this: You draw the black outline and the fill inside areas with colored paint. Then you place it above the scene image and move around or swap for other cels with different character poses. 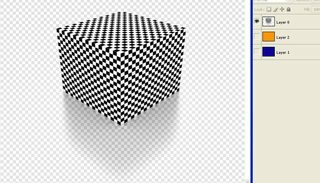 There are a number of techniques used to overlay 3D objects onto ready frames of anything else, used by all sorts of "magicians" in their shows. You could ask google how they did it before computers and find out something new. When a frame of anime is made, there are different layers to the images. 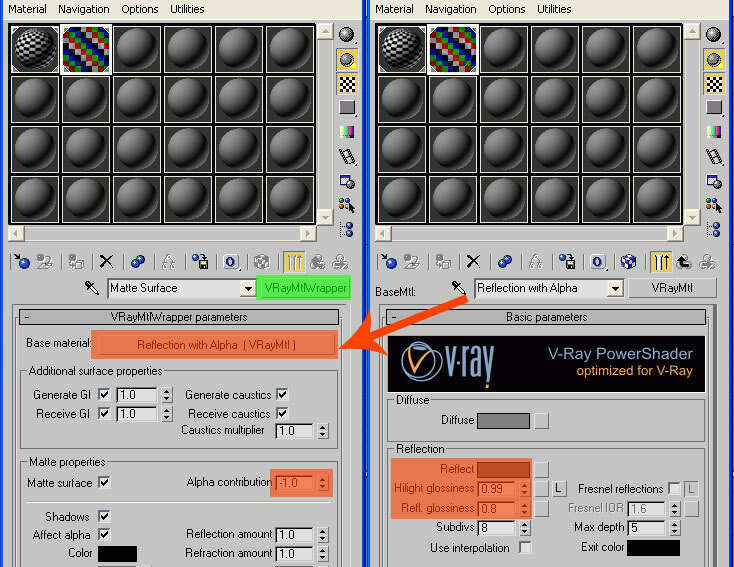 These allow for easy editing of a particular component. 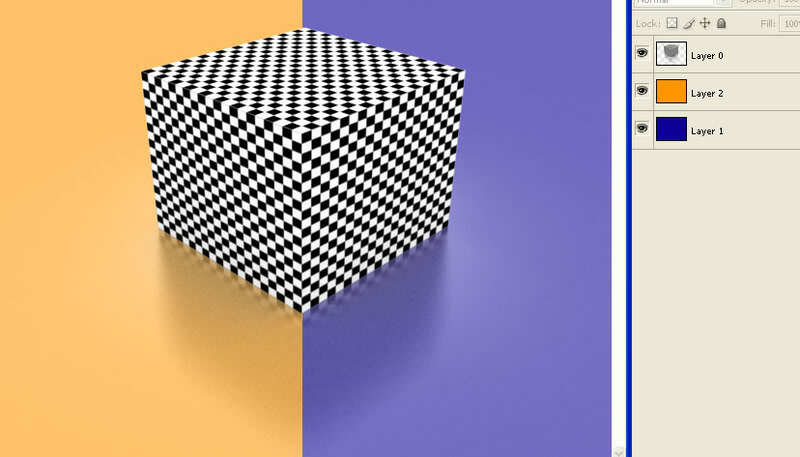 Here's an example image (taken from Wikipedia) . Presume that we are releasing an anime about this bird and this is the image that comes up in the title screen. We are ready to release the first episode, but the director says "actually, that bird is too far to the left, we need to change it.". 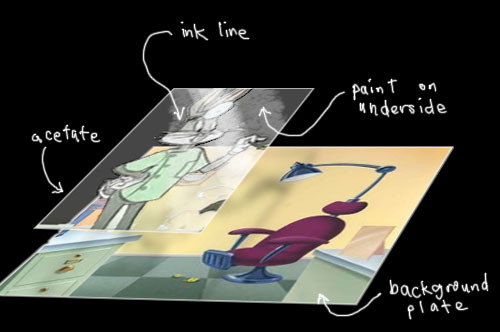 Because we're a very experienced set of animators however, we know that we should use layers. We have one layer with the background on it, and another layer that is transparent apart from the image of the bird. Moving the bird layer should be much less painful now. 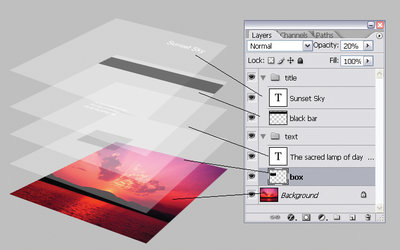 It is by using layers in images, that animators can put in other mediums such as 3d, or real-life photos with ease. 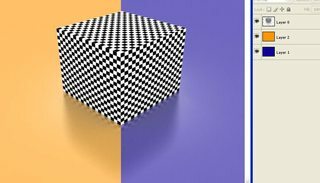 How 3D can be put onto 2D? 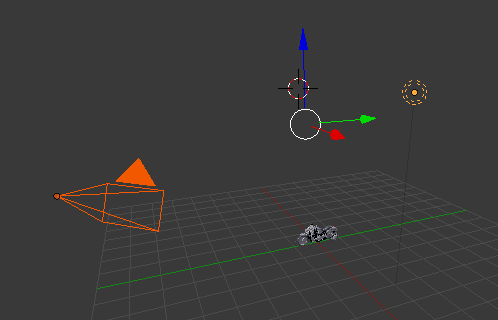 In the editor, you can control the camera (left) and the lighting(right) [both highlighted in orange] of the scene. This particular scene only has one light source, but you could have several. Editors usually allow the user to render a 2D image of what the camera can see. By moving the camera around, you could get all the images you need for the frames. You can then insert them on their own layer of the 2D images. There are some problems with this approach though, A better way of getting the result though. If there are multiple movements in the system it is hard to do keep track of their timing from frame to frame. Also, if other camera angles are requested by the director, the process must being again. For this reason, making scripted movements is a much better approach. 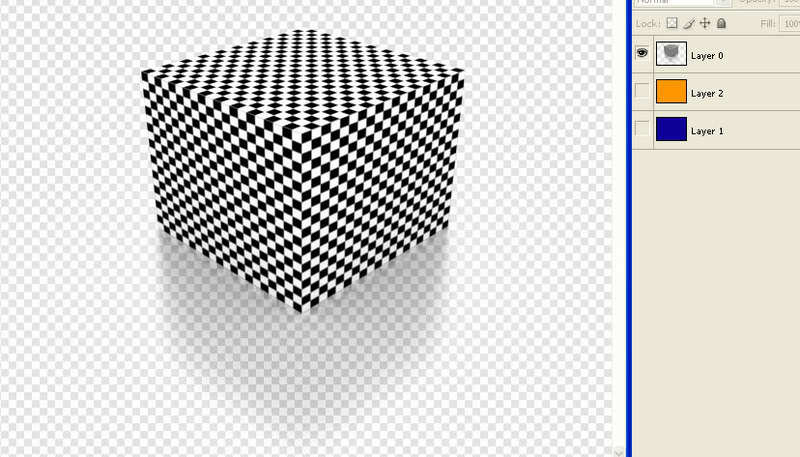 The frame-by-frame solution would work well for objects such as parked cars, or objects with little movement. 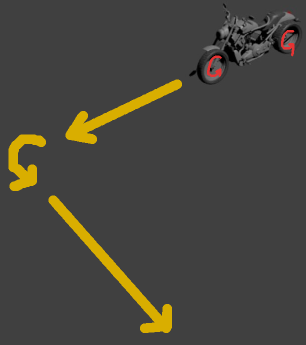 Manual setting of movements (examples: rotate wheel of bike 5rps, 'turn 30degrees left after 4 seconds) and Key Framing is how an animator sets up this system. 3D animators can then export the animation as several images, as seen from the camera's point of view. They can then be added to the layers of the 2D frames. And if the director wants to change an angle, all the 3D animators have to do is move the camera and regenerate the images. I'm not 100% certain about this but I imagine that the moving 2D parts of a frame are done after the 3D rendering as 3D's precise movements would make it hard to adjust for the 2D's less refined movements, wheras 2D is easily changeable to accomidate the 3D models - it also allows the camera angles to be changed early on. Is “Anime Studio” animation software used professionally in making anime? Do anime studios pre-record their voice actors before animation? What is the purpose of “second key” animation? Why is anime limited in animation? What's the meaning of 'slice of life' animation? Is hand draw animation fading? What are recent innovations in animation techniques? What exactly is “Sakuga” and how it pertains to the animation quality?